Rugged 304 Washdown safe Stainless Steel construction. 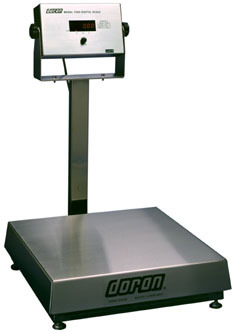 Displays weight in lb, kg, oz, g, or lb:oz. Pushbutton ZERO. Shockproof base with Quad Spring design that protects against shock and overload damage. 120 VAC, 60 hz. NTEP 91-106 Canadian approval AM-5188, AM-5241. Rugged 304 Washdown safe Stainless Steel construction. Displays weight in lb, kg, oz, g, or lb:oz. Front panel pushbutton ZERO. Shockproof base with Quad Spring design that protects against shock and overload damage. 120 VAC, 60 hz. NTEP 91-106 Canadian approval AM-5188, AM-5241.